1) All set to active: Sync to VBlank, Allow Flipping, Image Settings "Mid Range Scale set to - Quality", Use Conformant Texture Clamping. Getting around 40 FPS looking around airports and anywhere from 60-150FPS whether scenery or sea. Only problem, VSync is active, even via command line ( $ __GL_SYNC_TO_VBLANK=1 fgfs), however FPS within flightgear is still reporting higher or greater than 60 FPS! Overall seems better than previous versions, but likely somehow need to verify and make sure VSYNC is active by maybe browsing internal properties? Or is VSYNC to be assumed activated and just ignore FPS rates printed on screen? 2) Frame rates seem to increase, after toggling 3D console off, and then again turning the 3D console back on. First it appears the gauges consume 10-20 FPS, but after toggling the 3D console off and noticing the increase and again toggling the 3D console active again, I can see the gauges appear to consume less frame rates than when initially taking off from the airport and flying over the open sea. Odd. Maybe something with the updating of the gauges? Then again, might be nothing and all is normal. While FG has an option to throttle frame rate to a certain value, aiming for 60 fps vsync (or 30 fps if that can't be achieved) is usually something the GPU driver should perform (or, in the case of my GeForce 670M, does in fact perform). Within Windows when the NVIDIA driver vsync option is enabled; from my memory, other applications would not report frame rates above 60 fps, except for maybe intermittent 61-65 fps. Reading more into some Rembrant posted research by accident, I should also note I've also disabled most of the angle views, all except for First Person and Model view. Comparing the frame rate stutter or tearing seems to be similar to some other Windows' applications, however very apparently more gracefully handled. Either the NVIDIA driver vsync is not working as it should here, or flightgear is reporting possible frame rate without regard to vsync. Shrugs, just guessing as I haven't read the code! rogerx wrote in Wed Oct 14, 2015 1:38 am: Getting around 40 FPS looking around airports and anywhere from 60-150FPS whether scenery or sea. the driver is generally responsible for this stuff, and it can only be overridden using flags/environment variables that you need to explicitly set. Otherwise, FG does not do anything fancy with vsync. All the relevant settings, you seem to have found already. So, I would suggest to check some other OpenGL/OSG apps next, e.g. fgviewer/osgviewer or any of the osg demos. Alternatively, consider running an OpenGL benchmark to see what that is reporting. Bingo. I am now seeing frame rates being limited to 60 fps. I'm also now seeing roughly equivalent performance to one other Windows' applications I frequently use when compared to using Linux here for this discussion. Maybe yesterday I enabled vysnc within NVIDIA settings, of which required Xorg restarting, or maybe even the NVIDIA driver to reload -- but likely just Xorg restarting solved this. For this discussions record, users can further script the above options into a file for easier start-up. I've added a few commented lines for further possibilities. I've heard setting VSYNC on within the driver, and VSYNC off within the application is optimal, but could be just wishful thinking. There's a few other lines concerning optimizations, but those might not be needed anymore within FlightGear 3.6.0. Concerning my --prop line mentioned above, I'm seeing many of those options not listed currently within the 3.6.0 property browser. One or two are duplicates of what is already defaults for flightgear 3.6.0. And further BINGO! I've heard of setting bit depth lower than the default video card default setting can negatively effect rendering performance, and this looks to be the issue with almost all my frame rate settings. Setting View > Rendering Options > Shader Effects from Performance (default) setting to Quality setting, I can see frame rates bounce from the low 30's when looking at anything outside the aircraft window at the airport, to up to 60 fps! I think flightgear has a bottleneck problem/bug someplace within a pipeline someplace. Too many frame rates, and frame rates significantly drop. This is only evident when setting the Quality of Shaders slider from Performance to Quality, with likely your NVIDIA GTX 670 cards. Cheers! Only sometimes now do FPS drop to 30-40 when intermittently looking at the airport from inside the aircraft, but model view FPS looks great. How do these changes to the Video Card Trouble Shooting page sound? Last edited by rogerx on Wed Oct 14, 2015 5:00 pm, edited 1 time in total. rogerx wrote in Wed Oct 14, 2015 4:47 pm: Concerning my --prop line mentioned above, I'm seeing many of those options not listed currently within the 3.6.0 property browser. One or two are duplicates of what is already defaults for flightgear 3.6.0.
rogerx wrote in Wed Oct 14, 2015 4:47 pm: And further BINGO! I've heard of setting bit depth lower than the default video card default setting can negatively effect rendering performance, and this looks to be the issue with almost all my frame rate settings. rogerx wrote in Wed Oct 14, 2015 4:47 pm: Setting View > Rendering Options > Shader Effects from Performance (default) setting to Quality setting, I can see frame rates bounce from the low 30's when looking at anything outside the aircraft window at the airport, to up to 60 fps! rogerx wrote in Wed Oct 14, 2015 4:47 pm: I think flightgear has a bottleneck problem/bug someplace within a pipeline someplace. Too many frame rates, and frame rates significantly drop. This is only evident when setting the Quality of Shaders slider from Performance to Quality, with likely your NVIDIA GTX 670 cards. Cheers! Only sometimes now do FPS drop to 30-40 when intermittently looking at the airport from inside the aircraft, but model view FPS looks great. there is quite a bit to consider when it comes to graphics rendering... that's for sure! Thorsten: "In general, I would advise you to not post speculations on what causes the framerates you observe unless you have pretty solid test data ..."
What? I just reproduced this here. About the only item I have not performed, is a kernel reboot, or system cold start. I'd suggest you reread my posts or logging here, and then retry on your platform to see if you can reproduce. If you think low-level, this scenario is not unheard of at all. Ditto wkitty42. Quite a bit to graphics, low-level coding is much easier! About the only way for me to get 40 fps would be to stare at the sky with the ufo and all shaders, effects, and features off, no ALS, no clouds, no multiplayer, no scenery, no models, no nothing. The only way for me to get 53FPS is to start with minimal profile. First, because 'too many framerates' implies high framerate, so to continue the sentence with 'and frame rates significantly drop' makes no sense, because the whole sentence then says 'when I have high framerates, I have low framerates'. Second, you haven't posted anything reproducible. 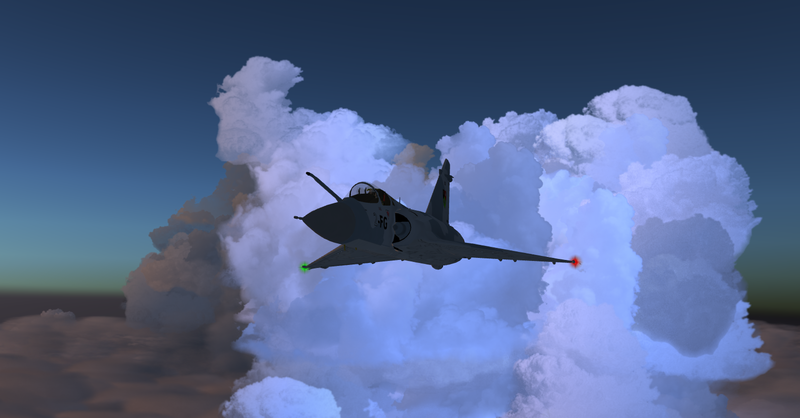 For meaningful benchmarking tests we need at least aircraft, location, LOD settings, rendering settings, visibility, weather settings,... Also, for a few comments on meaningful benchmarks, see here. Furthermore, I would never advise telling people to not post what they merrily think, unless those comments were considered defamatory. Even then, I usually simply ignore them. Well, that's your problem on the horizon. You can of course post whatever you want, but if you want the right people to read it, what you say has to have sufficient information content. Do you for instance know what internally happens when you move the quality slider? I think not, otherwise you would have known that the detailed setting is crucial information and included it in every report. I'm not interested at all in discussing idle speculations on how FG rendering might be done and what problems might be - I contributed a significant share to it and know its pitfalls reasonably well - I prefer to spend my time helping out people who actually want to understand something. As I said elsewhere. there's no shortage of people who feel they must tell everyone how rendering 'really' works. Given that, there is however a strange shortage of people who come up with fast and visually appealing rendering code.